The above print reflects the recurrent image of the devil myth that has haunted American war culture from the days of origin. 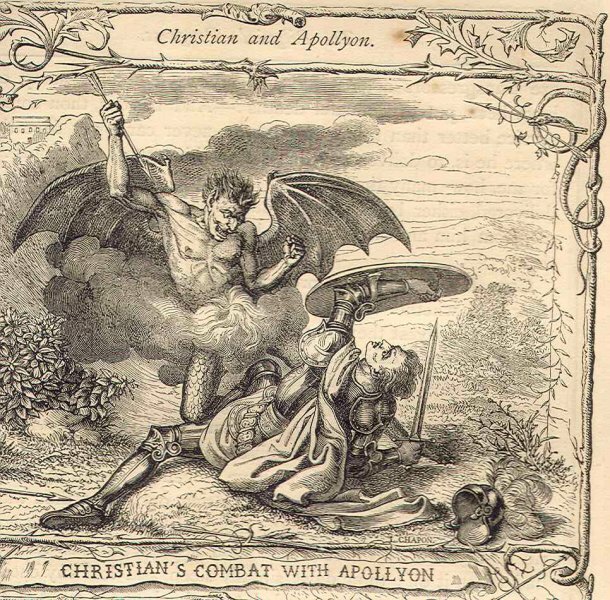 There is always a devil to fight, a beast to overcome, Beelzebub to defeat, or Apollyon to engage in combat. Then said Apollyon, I am sure of thee now; and with that he had almost pressed him to death; so that Christian began to despair of life. But as God would have it, while Apollyon was fetching his last blow, … Christian nimbly stretched out his hand for his sword, and caught it, saying, Rejoice not against me, O mine enemy, when I fall I shall arise, and with that gave him a deadly thrust, which made him give back, as one that had received a mortal wound. When one fright’s gone another doth him seize.